Boca Juniors are refusing to play the final of the Copa Libertadores. With the incidents that occurred on Saturday, Boca Juniors have asked CONMEBOL not to play the final. 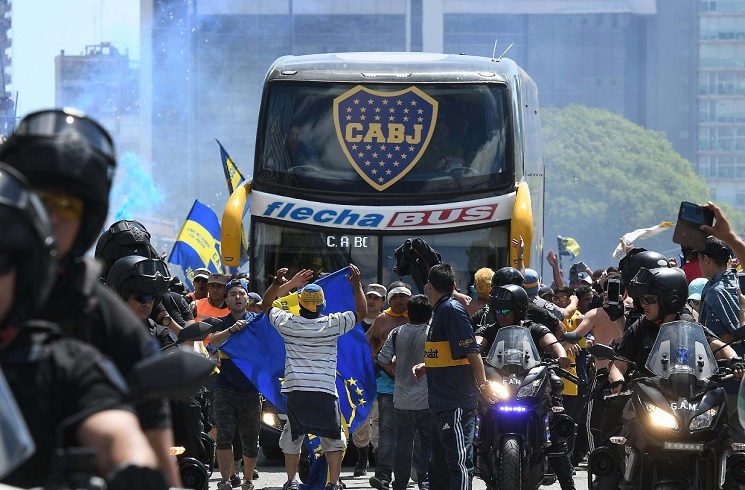 Club captain Pablo PEREZ would require surgery after receiving glass in his eye after the Boca bus was attacked and CONMEBOL are reportedly forcing Boca to play. River Plate fans have started to enter the Monumental. No word yet on what will happen but we will be continuing to update on the situation. River plate fans are complete disgrace because of their insane attitude towards footbaling rival. It’s football, not war. Boca is an Argentine club like River. Why the fans are so aggressiv? I don’t support either of boca or river but i hope boca wins, rather sympathetically. 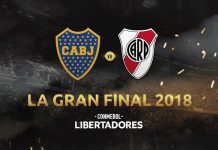 Boca vs River in the Libertadores final was supposed to boost Argentine football after this summer’s embarrassment. Instead they are adding to the embarrassment that is Argentinian Football. Absolutely disgraceful! The final should be played behind closed doors! Absolute embarrassment! Yes I’d rather Boca win after this, even though I don’t support either. 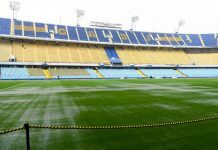 I really can’t imagine if Boca wins in Rivers ground what will happen to the players? ?R they gonna kill the Boca players?? Even if there is security, how on earth the Security people gonna stand up against an entire stadium of people? It’s like playing football in a Mine field. It should have been better to play the Final in a neutral venue. This was supposed to be the Final for ages, A Final for History books, Now? It’s such a shame Argentine Football is presented in a bad way in front of the World, how on earth an Event like the World Cup will ever gone come again to Argentina? You can’t blame FIFA if 2030 bid is rejected, first of all its peoples mistake, Mad people, what r they thinking off? destroying some players who play football for their living, What the Hell…We can’t always blame the Governing bodies like AFA for every nonsense’s happening. This all r done by Mad people who r ready to kill anyone on the name of Football. Come onnnn this is 2018 guys wake up and enjoy the game. AFA can’t prepare against such events its man made disasters. But still knowing the hatred between River and Boca there should have been taken better care of the Security arrangements. Well this we can’t tell authentically what is happening over there. wow the sage continues and its now Dec 8th-its becoming longer then a Peter Jackson movie. What if boca win ? After what happend yesterday i dont think we have any chance to host even a chess match . Lol caseres is no way a national team material, his positioning was so bad, not a single long or organized pass. O hello…..caseres was one of the best player on the pitch….he doesn’t offer much going forward but his tackling and passing was perfect…he also was the most fouled player on the pitch. Well, according to player fact, Caseres completed the most passes (35 out of 36 attempted, 97% accuracy) among players who have played 45 minutes or, more LOL. He took 46 touches which is probably lower than his usual stats. Betis barely attacked through the middle in the first half due to his presence. But I agree that it was one of his less glowing matches. I.e. the most accurate passer. 1 long ball and 1 key pass. His stats are consistently way better than the players we use as no.5. He passes were not dangerous at all, i am not talking about 2 yards pass in open space , he unnecessarly tackling, and slowing down the game of villareal. Paredes is 10 times better than him. He is a DM. He isn’t supposed to make dangerous passes. Still he created 1 chance. I don’t want to compare Caseres or, Ascacibar with Paredes. Paredes isnt a DM for me. Nice cooperation of two rising stars of Velez Vargas-Almada and the second scored his third goal in Superliga. Sorry that was Nicolas Dominguez goal. 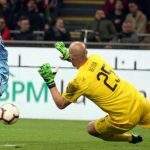 Argue for Scaloni to call him up finally? Anyway all the fourth Vargas, Gimenez, Dominguez, Almada looking like NT material. You apparently didn’t saw some of his Sevilla Goals and runs when his pace had a lot to do. I have watched all matches of j correa, he is not fast at all. J correa and pace are tho different things, a winger with no pace is useless. He is no more a kid 24 already, he is upside down of his career its time for him to return to superliga. I’m not really sure which correa you’re talking about but J.Correa is quite fast, particularly with the ball at his feet. As for attitude, well I haven’t heard anything bad about the kid when it comes to off field discipline so I’m not sure what you’re referring to. To be honest I think Correa’s been excellent when ever he got the chance, he scored twice and assisted one in the 3 games that he started so I don’t quite understand why he doesn’t get more starts because he’s quite good. For me fast player is mbappe, sterling, sane …..the quick acceleration type….I didn’t see this in correa ….and Gonzalo u r right I didn’t follow him in Seville. @shubham_v u are right, he not fast at all, here are some blind fans of j correa overhyping him for no reason. Compared to speed demons like Mbappé, sane, Cannigia, Maria, pavon etc…..then yes you’re correct he isn’t that fast, but he has good acceleration with the ball at his feet, which is what counts. 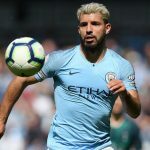 To tell you the truth I haven’t noticed any lack of initiative when he’s on the field and like I said, everytime he gets a start he either scored or assisted so maybe he should get more starts. 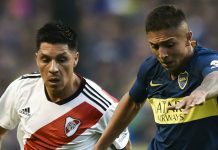 At the end of the day J.Correa’s position is one that Argentina has plenty of options ranging from Pity to Lamela to Ocampos to Cervi to Pavon to A.Correa and even the likes of Pereyra, Lanzini and Acuna can pull off that role so if Joaquin doesn’t hit his stride then it’s not a major loss to Argentina, although I hope he finds a consistent form because he’s got lots of talent. Lo celso is on the bench. Lol, you think he is a star on Betis? Yes he is the best player of betis, if you dont think so you rather didnt watch betis game. offcourse he’s on the bench, he played 2 games with Argentina and is most likely jet lagged from the long trip, if I was coach I wouldn’t start him either. Lol , lo celso came in and changed the momentum of the game.